We’re following the journey of ten Retired Racehorse Project competitors on their journey to retrain an off-track Thoroughbred in preparation for the Thoroughbred Makeover! First, let’s meet some of our horsemen. The Retired Racehorse Project’s Thoroughbred Makeover has nearly become a household name for equestrians: each year, hundreds of juniors, amateurs, and professionals travel to Kentucky from all around the country to showcase their training skills. With ten disciplines offered, this competition shows off the versatility of the off-the-track Thoroughbred or OTTB in an effort to promote awareness about the post-racing possibilities with this breed. And with some pretty amazing rewards offered for top placings, the growth of talent each year has been astounding. We have selected ten riders, each from a different competitive discipline, to feature each month of their journey with their new equine partners. We will see their successes and their struggles, their laughter and their tears. And as we follow along with their journeys, we will see the true flexibility of this amazing breed as the horsemen push the limits to retrain these former racers in less than a year. Welcome to the Retired Racehorse Project Showcase! 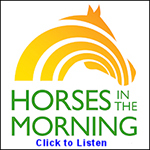 “I want to give back to these horses and be a part of their new lives off of the track. I can’t wait to spend the next ten months working with Jacob in preparation for the Makeover. Kallie grew up riding horses and began her journey as a professional at the young age of 11 when she began putting training rides on client horses. As her skills evolved, so did she — by 16 she was instructing other riders in lessons. With a training style based on natural horsemanship and the principles of dressage, she emphasizes on the understanding of a individual horses behavior and training needs. With almost 19 years’ experience competing in a variety of classes such as halter, dressage, showmanship, working ranch, and trail, Kallie is no stranger to competition. Over the years, Kallie has had the opportunity to work with countless Thoroughbreds that belonged to her clients and has thoroughly enjoyed the journey. She originally gave thought to participating in the Makeover a few years ago, but decided against it as she wasn’t sure she had time to dedicate to a project. That changed this past year when Kallie realized that this adventure wasn’t just about her — it was about the OTTBs that she could help along the way. Prior to initiating her search, Kallie drew out a list of what she was looking for in her new horse: over 15.3 hands (she is 5’9”); gelding preferred; a bay, grey, or black; great temperament; a kind eye that was calm yet bold. In conformation, she sought a horse that was sound with an uphill build, clean legs, short cannon bones, a good shoulder angle and a short back. Ideally, her horse would have a fluid forward walk and lofty trot with the trainability to compete in many disciplines over the years. Kallie also desired an older horse: many older horses are often passed over for something younger in the fear of wear and tear. She came across Jacob’s Lighthouse through an owner-placed advertisement on the CANTER Chicago’s website. At 16 hands and nine years old, this dark bay gelding fit all of Kallie’s wish list. With his unflappable but courageous personality he has taken in every situation in stride that she has introduced him to in-hand. Jacob is currently enjoying some downtime as he just came off the track on December 9th of 2016, but he has already been over multiple trail obstacles and has interacted with turkeys, dogs, cows, water, tarps, and vehicles. Despite some properly healed ankle jewelry, Jacob has a clean bill of health and the perfect mind for competitive trail. A fun fact about Jacob: he loves to roll in his stall, especially when there are fresh shavings! He will roll very carefully on both sides and look like a shavings Appaloosa when he stands back up, only to shake it all off a few moments later. “I was just scrolling through Facebook one day, saw her picture, and that was it. I had to have her. Victoria has been riding for over 20 years and has competed in many different disciplines along the way. You could say the love of horses is a family trait; her mother previously showed Tennessee Walking Horses and her father in law was the renowned jockey “Go Go” Garrett Gomez. Always surrounded by support for her passion, she has retrained four other OTTBs during her time in the saddle and dreams of a career retraining OTTBs to be successful hunters and jumpers. Over the years Victoria has won many different year-end titles in the hunters, jumpers and equitation. Most recently, she was showing in the 1.10m jumpers with her previous OTTB mare, Mattie, who sadly passed away in August of 2016. Since then, she has been focused on raising her two young children while her husband has been away in the military and dreaming of owning her own horse again. Ever since the RRP opened to the public, Victoria has dreamed of participating, but it was hard to find the right time with her husband being enlisted. She wanted to put her past experience working with OTTBs to the test by exhibiting her work on a larger platform. This year, her husband’s contract is up and Victoria felt it was finally her time to pursue competing in the Makeover and checking this dream off of her bucket list! She has hopes that participating in the Makeover will help her transition into a professional role in the equine industry one day. Victoria actually has two horses that she intends to showcase at the Makeover this year. Prior to purchasing the mare she will be repurposing for the jumper ring, Victoria fell in love with a bay gelding by the name of Majerus (barn name Sailor) through Amy Paulus of Paulus Racing and Performance Horses. One day while scrolling through Amy’s feed of available horses, she stumbled across Madre Baeza (now named Athena) and it was love at first sight. Athena so greatly reminded Victoria of her previous horse, Mattie, who was also a feisty gray mare. Victoria was not only drawn to the likeness to her former mount, but she admired how proportionate Athena was and her great shoulder. Her confirmation just screamed “athlete” and without a second thought, Victoria added her to her family. “Being an amateur, I am looking at this opportunity to learn about a different discipline and just have fun with it. We often hear about the struggles of being an adult amateur and Katie McIntyre is no stranger to the game. With a full time job in the finance industry, Katie finds herself mostly riding at night and lately, in the dark! She spent the first 20 years of her riding career in the hunter world, but has recently transitioned into eventing. A huge fan of the OTTB, she has always ridden retired racehorses, all with various levels of retraining. In her spare time, Katie volunteers and serves on the board with the popular racehorse rehoming initiative After the Races. You could say her life heavily revolves around OTTBs! With her involvement in all things OTTB, she is no stranger to the RRP. She has always admired the event and felt it was a great way to showcase the talent of the off-the-track Thoroughbred, but the timing just never fell into place in the past for her to have an eligible horse. In 2016, Katie attended the RRP with After the Races as a vendor and spectator which sparked a passion inside to return as a competitor in 2017. With the purchase of one of her own OTTBs by a dear friend this past fall, she found herself with an empty stall and the opportunity to make that dream come true. 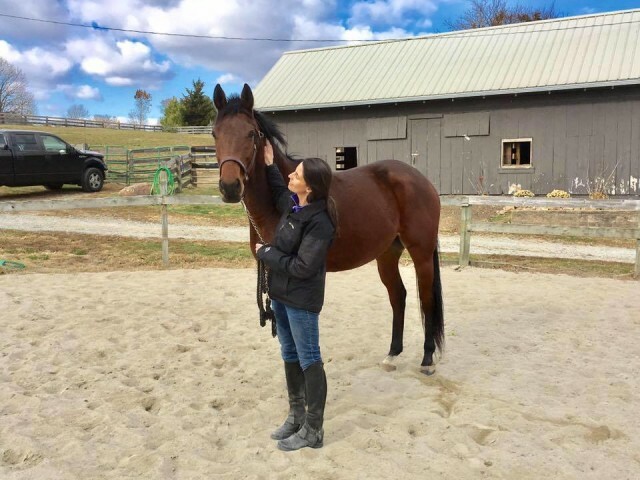 Katie’s connections in the OTTB industry made finding her Makeover horse an easy search — she had quite a few to select from thanks to After the Races. She found Port Suez, her fourth adoption from ATR, a handsome bay gelding. Keeping in mind her ambitions to show in field hunter, she was seeking a horse with a good mind and temperament. She needed a horse that wasn’t flustered in new and exciting situations. It was also very important to Katie that the horse she competed this year had the ability to go on and event with her after the Makeover. Overall, her major requirements were a horse with a good shoulder and no major conformational flaws. On the day she went to meet Port Suez she was blessed with good weather and was able to watch him move and free jump, an important factor that led to her decision. Another thing she was really watching for was a horse with good feet! With the limited retraining time to factor in, she hoped to avoid having to spend months growing out hoof walls and dealing with shoeing issues. According to Katie, poor Porter isn’t built like your typical OTTB. She thinks he is shaped a bit more along the lines of a potato, so he has rightly earned the nickname of Portly Porter for the duration of his RRP training! “Having a horse who is so engaged makes me that much more excited about our journey to Kentucky! Some people are born with horses in their blood, some people get hooked on horses through family friends — Heather caught the horse bug when her preschool teacher brought her horse to school for all the kids to see! Thanks to her mother’s support, Heather’s horse skills grew through 4-H, first without a horse, then with a lease, and finally with a horse of her own at the age of 12 — a 6-year-old Arabian named Glitzy. Heather and Glitzy received many 4-H state and local show high points together. Upon graduating high school, life led Heather to the Oregon Army National Guard. She completed her basic training and attended Linn Benton Community College studying Equine Management. There, she competed on her intercollegiate equestrian team and was the first student to compete at the Intercollegiate National Championships in Novice Over Fences. For 15 years she has balanced home life and military life. After deployment to Iraq and Afghanistan, assisting with relief areas for Hurricanes Katrina and Rita, and working full time at Joint Base Lewis McChord, she finally set down roots by purchasing a small farm in Washington three years ago. Heather has followed the RRP Makeover for the past few years and had always nursed aspirations to attend, but her busy schedule has always kept her back from entering. This year, things have fallen into place at the right time so she made the decision to do this one thing for herself. She filled out her application and decided this would be her year! She decided to add one more to her herd of six, five of which are Thoroughbreds — making her no stranger to the breed. Thanks to her belief that the best horse is one who is exposed to it all and a background in western riding, she decided on competing in working ranch as her primary class — then the horse search began. She first saw Go Henry on Facebook through a racetrack friend of hers and lightly inquired about him, but with her barn full with training horses she didn’t immediately make a move. A month later when her last training horse went home, she called about him again, and upon discovering he was still available she made arrangements to bring him home. She didn’t look at any other horses and picked Henry off of the only photo she saw of him, but took the seller’s word that he would be good for anything — and she hasn’t been disappointed so far! Her biggest factor when selecting her makeover horse was one with a good working attitude and some natural instinct, both of which Henry happily shows. With the snow having kept them grounded a bit, she has only had a few rides on him so far but is overjoyed by his personality. He is the first to greet her at the fence line and eagerly follows her around the field. As you can tell, Henry is quite a selfie queen. According to Heather this is a normal meeting between the two each day. Couldn’t ask for a better fit! “I believe every horse deserves a second career as long as they can have one. 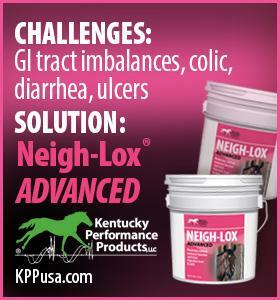 After 25-plus years of working with horses, you could say this comes naturally to Amy Lent. She started through 4-H and went to the state championships in saddle seat, working hunter and keyhole, along with many Production horses (shown as youngsters). In high school she competed in rodeo, open shows, and A-rated Arabian shows. But her experience with horses doesn’t stop there! She also showed draft horses in halter and driving for several years. She has been rehabbing and retraining OTTBs for around 20 years now to help them adjust to new lives from trails all the way to the jumper ring. Many of her projects have found homes with 4-Hers. Last year, she was able to make a drastic life change and quit her full time job to work with horses as a professional. Amy is no stranger to the RRP. She competed in 2015 and took second and Top Amateur Freestyle at the Makeover driving her horse Face of Glory. She returned again in 2016 and was itching to compete for the third year in a row. She loves what the RRP is doing for Thoroughbreds and that everyone who participates, volunteers and trainers alike, want what is best for the horses. Beck’s Mill was not Amy’s first choice for the RRP — in fact, he wasn’t even her second. Amy had gone to Second Stride to adopt a mare she was considering using for the Makeover and they asked if she would be interested in him. Beck was passed over a lot by adopters since he came to Second Stride in 2016, most likely because he does have some issues that followed him after his career at the track. A tendon injury and a need for chiropractic work to adjust his hips render him only suitable for lower level work, but the more Amy got to know him the more she appreciated his quiet disposition. Despite original intentions to rehome him quickly, his readiness to work and level-headed attitude quickly earned him a spot as her Makeover horse after Amy’s first ride on him. He will have some filling out to do and is going to have to put some work in to get stronger, but Amy says that she relies more on personality than she does on perfect conformation and Beck fits the bill! Amy says that Beck prefers people to horses, but by the look of it I would say he has a pretty good mom to get attached to! Stay tuned for next week’s article introducing our remaining featured riders and check back monthly for status updates. Go OTTBs, and go riding!